Beyond The Old Teaching: 6. THE ARYAN PHENOMENAL ASTRONOMICAL DATING BY PON! 6. THE ARYAN PHENOMENAL ASTRONOMICAL DATING BY PON! These maps depict the temporary settlements by the Aryan-Cro-Magnon people. These Spreading Cards to the northern latitudes are based on extensive investigation by dating the temporary settlements of the Aryan-Cro-Magnon hunter-gatherers. Scientists discovered many temporary settlements of the early developed Aryan hunter-gatherers, their stone axes, knives etc, for the dating. The Aryan-Cro-Magnon People were moving their settlements frequently during this time. As a result, the Cro-Magnon people became the Areal-People, and their tribes became the Areal-tribes. The name Aryan (means areal) was chosen by the Cro-Magnon people for the own race. Little by little Aryan-Cro-Magnon Tribes developed their astronomical knowledge from solar years to precessional cycles. They created phenomenal astronomical calendar based on observations from N30 degrees. In dating they used Sothic calendar with period 1473 years and Peak of OrioN (PON). In addition for the dating they used movement of solar planets over the constellations, with their visible and invisible positions on the night sky. We have irrefutable proof in the Ankhor Wat about dating by using precessional cycle. In the Majestic complex of Ankhor Wat, that was built near the post-flood boundary ~(10.465÷10400)B.C. , last three Apocalypses are recorded by using Precession angles. We have epochal corners towards the constellations of Leo, Aquarius and Cancer. From the "center of the universe" drawing direct line through the centers of three epochal man-made reservoirs, indicate straight the constellations of Leo, Aquarius and Cancer. In the centers of epochal reservoirs are survived only remains, almost destroyed epochal churches. Occupying the great northern areas, Aryan-Cro-Magnon almost went extinct at the terrible Aquarius deluge boundary ~23,214B.C. 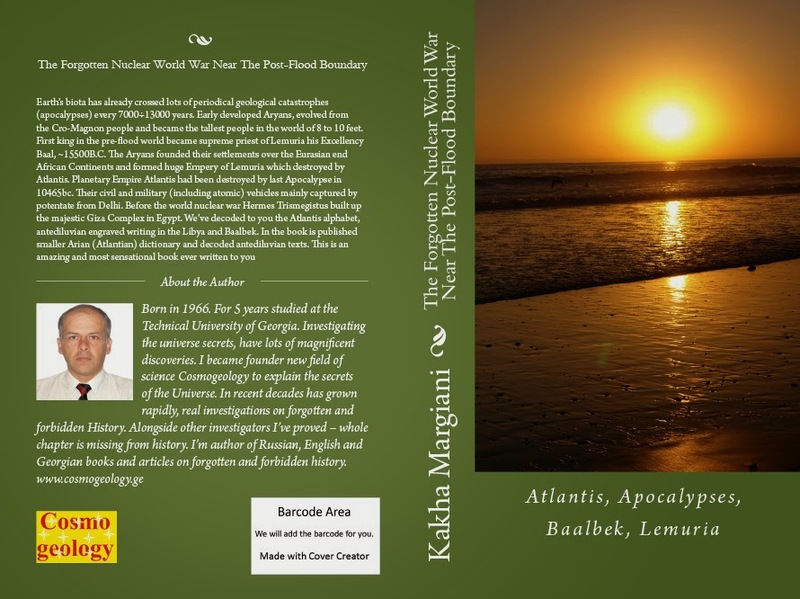 During the Aquarius deluge, huge tsunamis covered wide areas of all the continents around the Earth. Floods reached even the lesser Caucasus mountain ranges and their “roof”, the wonderful volcanic mountain Ararat. Only a few Caucasus Aryan-Cro-Magnon tribes avoided the huge extinction event. According the genetic researches Patriarch of the Caucasus Aryan-Cro-Magnon tribes became M-17 (Man-17) R1a;Y-DNA. After the Apocalypse of Cancer’s Epoch ~34.289B.C. happened the Aquarius event in ~23.214B.C. and last Apocalypse destroyed everything all around the Earth in the Epoch of Leo ~10.465B.C. Using thousand of genetic researches we have found conclusive evidences about our great Aryan ancestors. The genetic tree represents Atlantians’ line (red) and their assimilated subgroups. According to genetic researches in the era of Cancer (~36,000 YBP), an advanced race of Aryans produced two assimilated subgroups in the primitive aborigines’ tribes: «N; Y-DNA and O; Y-DNA». ~32,000 years ago, some tribes of Aryan-Cro-Magnon left Asia and assimilated into the primitive tribes of America. This assimilation created a new assimilated genetic brunch known as the Olmecian people - «Q; Y-DNA». Thus «Q» became Olmecians’ genetic branch. After the last Apocalypse in 10465B.C, the surviving Olmecians, have been assimilated once again into the small survived groups of the Aryans. These assimilations produced ancestors of The Aztec, the Maya, the Inca…etc. 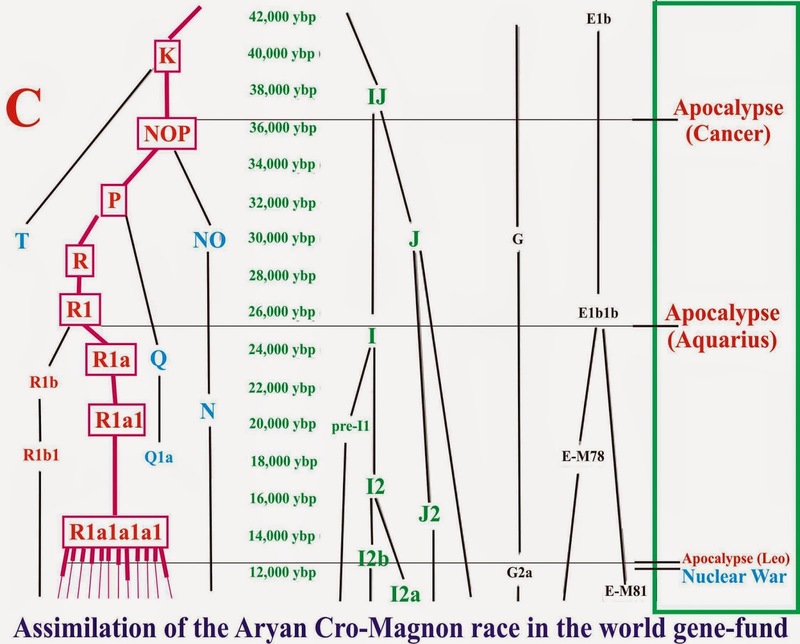 An important genetic branch of the early evolved Aryan tribe «P» at the apocalyptic boundary Cancer (~36,303 YBP) preserved the natural genetic branch of Aryans. Researches in genetic is interrelated to biblical information. Great biblical patriarch «P; Y-DNA» in Mesopotamia could be Adam only → M-45 (Man-45). Patriarch of the Aryan tribes in the Mesopotamia, Man-45, the great biblical patriarch – Adam and generation of his tribe preserved the natural genetic branch of the Aryan-Cro-Magnons. Mesopotamia situated by tropical zone and Adam’s tribe of Aryans had best environmental condition over the valleys of two rivers. The climate was mild throughout the year. Trees throughout the year, increasing the thickness evenly and therefore had no annual strips. Observations on genetic palette of modern people and archeological discoveries of natural Aryan skeletons vividly show that the «P; Y-DNA» tribes were Aryan tribes, descended from the Great biblical Aryan patriarch Adam. These early tribes spread from Mesopotamia across the Eurasian and northern African areas. «P; Y-DNA» tribes of M-45 (Man-45) became the main gene-fund for the not assimilated populace of the Aryans. Thus they became early developed European tribes of the Aryans. They had no rival human tribes within northern areas and this is amazing indirect evidence why they preserved natural face, not assimilated populace of the Aryans. The Aryans first began using fire to prepare food. They could feed better, by comparison other human tribes. High-calorie food and good environmental conditions helped them to become the most powerful and advanced race worldwide. These tribes are known in the scientific community as the European Cro-Magnon tribes. M-17 (Man-17) R1aY-DNA within the Caucasus mountains preserved natural gene-fund of Arians 8÷10ft tall. Proof you can read in the first book of the trilogy. The Aryans captured whole Earth and formed Atlantis planetary Empire. Traditionally they were constructing megalithic artifacts worldwide by using volcanic and stone flour technologies. Aryans used own phenomenal Astronomical calendar for the epochal dating, made by stellar observations from N30 degrees. In addition Antediluvian civilization of Aryans applied for the dating of the epochal events their unique Sothic calendar, which had huge period 1473 years. In addition Aryans used the Alnitak calendar based on the annual measurement by Peak of Orion. It is well known that the Earth has recently entered in the Age of Aquarius. During the orbital motion of the earth for a year, our planet crosses all main 12 constellations of the zodiac. Axis of the Earth for about 1600 years will be permanently tilted in the direction of the constellation Aquarius. Now Summer solstice occurs in June 22 occurs when the Earth's axis is oriented at the constellation boundary of Aquarius and fish. The constellation of Orion is between Taurus and Gemini. The Aryans used Peak of Orion to identify each solar year of Earth from N30 degrees. From N30O of Earth maximal value for the PON appears when the Earth is moving between the sun and constellation Orion. Brightest star of the Orion's belt - Alnitak had been chosen by Aryan astronomers for the permanent astronomical coordinate from N30 degrees. Aryan astronomers discovered amazing rule. They could knew all stellar coordinates for the any year from N30 degrees, by knowing all epochal PON from N30O. Of course they could know the coordinates of all visible and invisible stars of the sky for the each year from N30O. Alnitak in the belt of Orion is situates almost on the ecliptic, and now its peak can be measured at the end of February (~34÷36th point, Axis in Taurus) on the midnight meridian. b) Approximate position of the Earth's axis tilt, during the last two apocalypses in the Age of Aquarius (A=23,214B.C. ), Leo (L=10465B.C.) and the PON position for the peak of Alnitak in Orion's Belt (O=PON=45O) for both apocalypses. The first conclusive evidence of how antediluvian civilization of Atlantis Aryan race was dating a landmark event by PON we found in Libya on the huge megalith. ▪ AVG ▪ = Virgin’s era (Age of Virgo); In the Latin version, the word denoting the era underwent dialectical distortion. Word "Ager" into Latin dictionary is connected with the Earth. More exactly is that - "The Earth is in the era of the Virgin" (Age of Virgo). : This is the great astronomical epoch, of 14,488B.C. to 11,348B.C. Full Atlanto-Iberian, Atlanto-Egyptian, Atlanto-Slavonic and old Aryan Alphabets and other unique database are published in the first book of trilogy “Forgotten Nuclear World War Near The Post-Flood Boundary”. ▪PON▪="Peak of OrioN". Unfortunately value of PON is demolished (▪PON▪▓▪) but our investigation shown irrefutable proof by using letter – ▪M▪. Exploring the sensational artifact we came to conclusion. The damaged letter in the engraved text is ▪M▪. 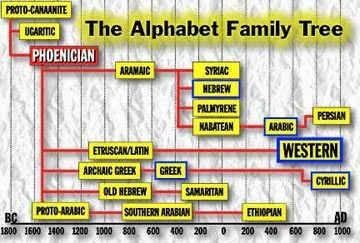 Letter "▪M▪" in the Aryan-Areal (Iberian, Coptic, Slavonic…) heliocentric Alphabets had numeral value 40. Thus the epochal dating on the Libyan stele, by using Aryan phenomenal astronomical point of PON is decoded – PON=40O. In the Roman language, the word denoting the peak underwent the dialectical distortion – (lat. apicem). Orion was the pre-historical giant hunter 2.5÷3.0m. tall in size. Orion from Aryan settlement of Boeotia (ancient pre-flood Hellenic region on Balkan Peninsula,) was beloved of Aurora. Orion was killed by Diana and forced to "undergo transformation" along with his dog into the constellation. Of course the Aryans loved their hunter, after his tragic death, Aryan priests decided to immortalize him and bestowed his name upon the heavenly constellation. In a place with him his dog was granted immortality too, which was a loyal friend of Orion. More than 16,000 years after this tragedy, they are moving together over the sky. Sirius, the brightest star in the sky situates in the dog constellation. The constellation is known as a "Big Dog". We now know with certainty that the peak of Orion at the zenith of the night sky meridian used for the dating of important historical events by Aryans. It is well-known that the peak of Orion used for the dating the Apocalypse in 10465B.C. on the Giza Plateau and Stonehenge. The peak of Orion was used in Teotihuacán for the dating Aquarius Apocalypse in 23214B.C. as well. Now we know exactly that the Aryans from ancient times had a special scale for the dating of historical events and they used the Peak of Orion on night sky meridian. The Aryan scientists used letters and numbers for dating by the Peak of Orion. Each letter or number on the scale corresponded to a different peak (Zenith) of Orion, on the night sky meridian (KE=25O; L=30O; LA=31O; LE=35O; M=40O; MD=44O...) from N30 degrees. It is well-known that due to the precession and swing of the Earth axis and rotation around the Sun, changes peak of Orion every day. Of course, if we have the special scale, doable dating each ancient year, by Peak of Orion, in any era. Since we do not have a special scale for dating by Peak Orion, we certainly can not understand the very exact dates for the landmark events from the forgotten and forbidden history of Atlantis. ▪ AX ▪. = (lat. Terrae axi); "Earth's axis". ▪ POI ▪ XXIV. = "Point 24" - "Point XXIV". According IAU boundaries for 38.2 days Sun moves within the Taurus constellation. Thus peak of the Orion at the zenith, on the night sky meridian had 24th point in the Taurus on our calendar corresponds a day of meeting in the epoch of Virgo, when the earth was moving within Taurus. The stele inscription presents an aboriginal script as well of the Libyan. The antediluvian history knowledge can help us for the next dating, of 13,118 B.C. to 11,348 B.C. My knowledge allows me to announce much more approximately date – September, 14488B.C. The final transcript of the first line. : "in 24th point of Taurus, in 14488B.C, within the era of Virgo, was compiled Firman, for the accurately partition inner boundaries between areas (case-areas) of Empire - between the Caesars"
Full decoded text from the Libyan megalithic stele is published in the first book of my trilogy on forbidden and forgotten history – “ForgottenNuclear War Near The Post-Flood Boundary”... We decoded to you in the first book engraved Aryan writing in the Baalbek and proved that the Titanomachy - battle between the two confederations of Titans (8÷10ft tall) was real event. In addition by using real Aryan words in the first book is published smaller Aryan-Latin-English dictionary and real historical information on nuclear war, for the post-flood monopolistic power. Information on nuclear war was written on the golden tablets by Aryan runic (church) inscription and known as a Aryan-Slavonic Vedas. Aryans were writing on the golden pages only and only very important information. According the false mainstream teaching before 1800B.C. our ancestors were too primitive. They did not know writing and were too naive and wild people. In my books is destroyed all false mainstream fantasies and teaching in the historical sciences and so called “Egyptology” is fully exploded. Old false teaching produced many false “researches” and false degrees. Funding false “researches” causes intellectual disorientation of the young generation. Development of false in the many scientific fields is the greatest crime against mankind. We have already found great incontrovertible evidence that antediluvian civilization cycle of the Aryans for dating epochal historical events used an amazing phenomenal astronomical calendar based on the PON, when the earth was moving in the constellation of Taurus. On the Earth are built two majestic pyramidal complexes, which are the mirror images of Orion's Belt. If our finding is true, we should find in these complexes the dating proof of events by PON. Of course, it would be one of the most important phenomenal discoveries of the XXI century. The most magnificent discovery in XXI century will be the sunken citadel of Atlantis on the Mount Meru [nhieru] between the Santa Maria and Sao Miguel isles of Azores. We found that the pyramidal complexes on the Giza Plateau and Teotihuacan have the opposite direction of Alnitak to Mintaka. The pyramid complex at Giza Plateau just focused on the modern north geographic pole, while the Teotihuacán pyramids are oriented to pre-flood Geo-Pole. 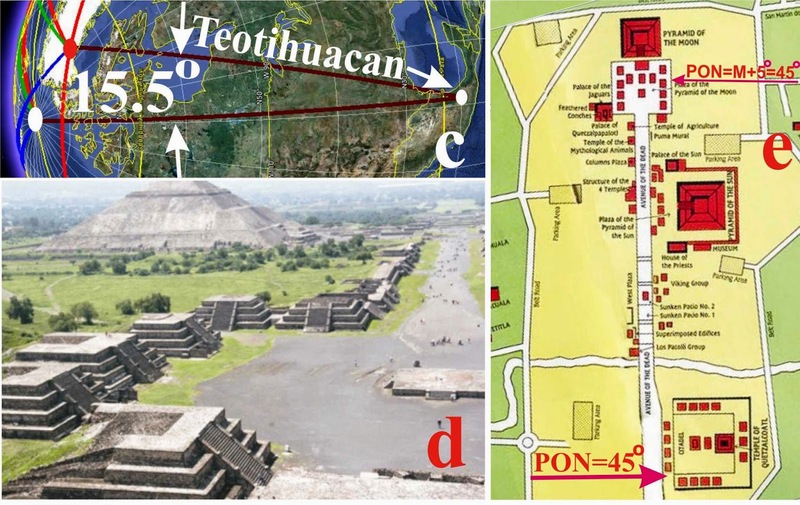 The image represents how the pyramidal complex of Teotihuacan is focused on pre-flood Geo-Pole to the northern part of Greenland and has an inclination by 15.5 degrees, from the present geographical pole. In front of the Pyramid of Moon, which is a mirror image of the Orion star - Mintaka, on the square you can even read the letter "M". In the primordial complex here was constructed 10 smaller pyramids with 4 steps (10x4=40=M). Nearby of these smaller pyramids now situates restored 5 steps pyramid (40+5=45). We found that the mirror image of the brightest star in Orion's belt - Alnitak was constructed on the antediluvian N30O. In a mirror image of Alnitak in Teotihuacán around the perimeter of the square, which is a virtual foundation of the main pyramid are sown 15 points. These figures have a large square profiles. The 15 squares around the perimeter have a double meaning. We can easily read an important landmark dating by using PON - N30O+15=45O. In addition the 15 square figures around the perimeter accurately date the Teotihuacan complex, when it was built. 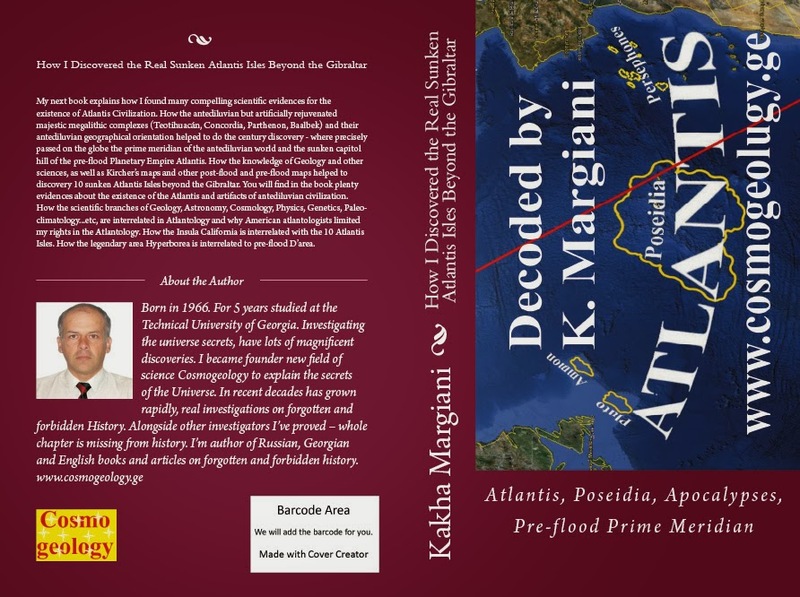 The decrypted second important meaning, you can find in the third book of my trilogy - "How the Precious Stones and Metals Exterminated Aryans near Post-Flood Boundary." Mirror image of the brightest star in Orion's belt - Alnitak on the Giza Plateau was also constructed by survived Aryans on the N30 degrees, from the modern geographical poles. We even know that the landmark complex on the Giza Plateau is built by Hermes Trismegistus. This is already proved in my books. I’ve proved in the trilogy greatest epochal mission of Hermes Trismegistus and decoded to you his cartouches. Hermes Trismegistus was greatest Pharaoh of the huge terrain from the Great African Lakes to the Nile Delta. Mirror image of Alnitak on the Giza Plateau has no problem to read. The landmark dating by using PON is written in the southern shaft oriented to the Alnitak and shows an important landmark date. The southern upper shaft is directed toward the southern sky, where is moving constantly constellation of Orion on the night sky. The slope of the southern upper shaft to the horizon composes exactly 45 degrees. In addition to the Giza Plateau accurately recorded the last Apocalyptic date. Exact Apocalyptic time of the year is written on the causeway – 21 October. The epochal great Sphinx indicates apocalyptic epoch of Leo. In the original design by Hermes, Great Sphinx had face of greatest Pharaoh Horus. Body of Sphinx was an exact increased proportions of the King Fauna - Lion. Thus the last apocalypse happened in the era of Leo. The exact Apocalyptic year is deciphered as 10465B.C. Strongest apocalyptic earthquakes began on October 21 and lasted for three days 21,22,23 October. During this time the continents covered by global drifting distance of 1000÷1500km. The geographical poles changed by 15 degrees. The event did not change nutation and tilt of the Earth axis. Figures below not drawn by scale. 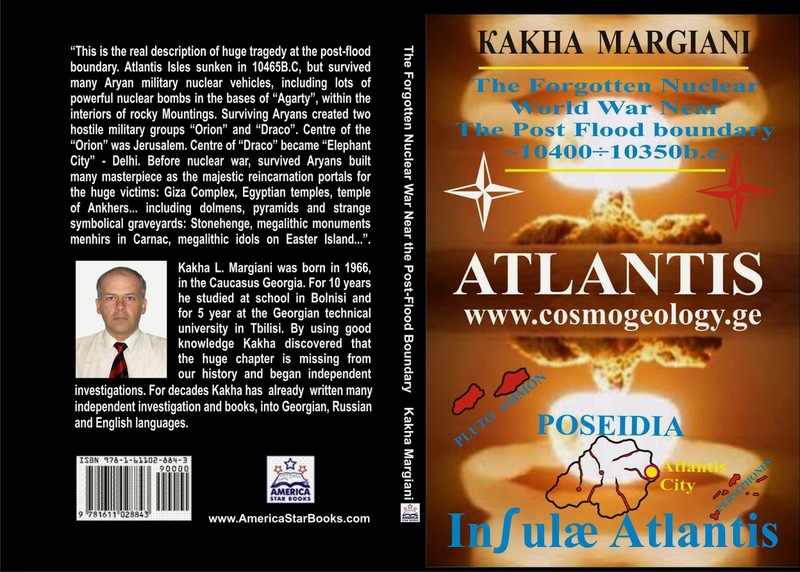 How the reversal of the global magnetic field happened in 10465B.C, is explained exactly in the first book of the unique trilogy - "Forgotten Nuclear World War near the Post-Flood Boundary". with the oscillation period T=44,000y. Confirmation of apocalyptic dating by PON we found at Stonehenge as well. Modern pseudo-historical science show false date of Stonehenge as a maximum 3020÷2910B.C. The Stonehenge dating as well as other Aryan artifacts vividly show red line for the official science - nearby 3000B.C. Each brave scientist who dares to cross this line can lose everything in science: the money, the power, the scientific perspective... Our research shows some amazing ancient message by Aryans. Now you can understand easily why the Stonehenge was built in reality. Unfortunately these genius messages sent for future generations by our great ancestors - Aryans, our civilization can understand after ~12450 years only. Central megalithic circle of Stonehenge has some meaning. Two of them are shown on these pictures. Now we have irrefutable proof that the Stonehenge was dedicated to last apocalypse in 10465B.C. and for the souls of dead. Recorded summer solstice in Stonehenge is the record of the catastrophic event when forces of darkness prevail over the forces of light. After each summer solstice, the darkness begins increasing. It has allegorical meaning that is triumph over the light by darkness. An indication of the summer solstice in Stonehenge symbolically means tragedy when darkness became winner. Standing stones in Stonehenge are the symbolic graves for the uncountable victims of the Apocalypse. We can see clearly on the Moon's orbit second "moon" - captured asteroid - Fata. Now we know exactly that the large fragments of Fata became the powerful detonator forces for the last Apocalypse in 10465B.C. The upper image shows location of the solar planets at the time of Apocalypse. After each summer solstice night is increasing. Darkness is winning. Thus summer solstice indicates on boundary when Darkness became winner! I’ve explained that the Aryans had an interesting tradition to write epochs by PON. In the Stonehenge is written genial message to us on greatest tragedy – the Aryans’ magnificent message encrypted after ~12450 years. According the International Astronomical Union (IAU) constant astronomical-astrological data, now we know that the greatest catastrophe was ruling by constellation of Virgo. Thus in the Stonehenge is written → 10 –Virgo. According the IAU constant boundaries, sunrise within the Virgo continues for 45.5 days of 17 September to 31 October. 10 points before 31 October, on October 21 happened terrible event written in the Stonehenge. Actually 10 megaliths inside shows symbolical graves of victims, for 10 days before Earth moved within Virgo. Aryans had an amazing astronomical calendar. In the calendar Aryan astronomers had Observations on stellar movement from 30 degrees. Letter “O” is written by 30 megalithic stones and main megalithic circle symbolically indicates on N30 degrees - N30O of the Earth. For the PON (peak of Orion) we have 60 megaliths in the letter “O” and 15 megalithes in the letter “n”. From the Genial Giza Complex now we know exactly value of PON=45O. From the N30 degrees of Earth, 60O and 75O for the Al-Nitac in the epoch of Leo is not a plausible value. We have to remember how the PON is written in the Teotihuacan. In the Stonehenge we have a symbolical model of Earth from N30 degrees (N30O). inside we have 15 megalithic stones for the additional points. Thus Stonehenge says PON=N30O+15=45O We have an additional irrefutable proof. Stonehenge confirms Apocalyptic Date in 10465B.C, written on the Giza plateau by Aryans. In the Stonehenge central circle letter “O” has dual meaning. It represents the Earth from N30 degrees as well as Sun. Mirror image of the solar system approximately indicates their positions 12479 years ago. Coordinates of the visible planets are interrelated to corresponding constellations in 10465B.C. 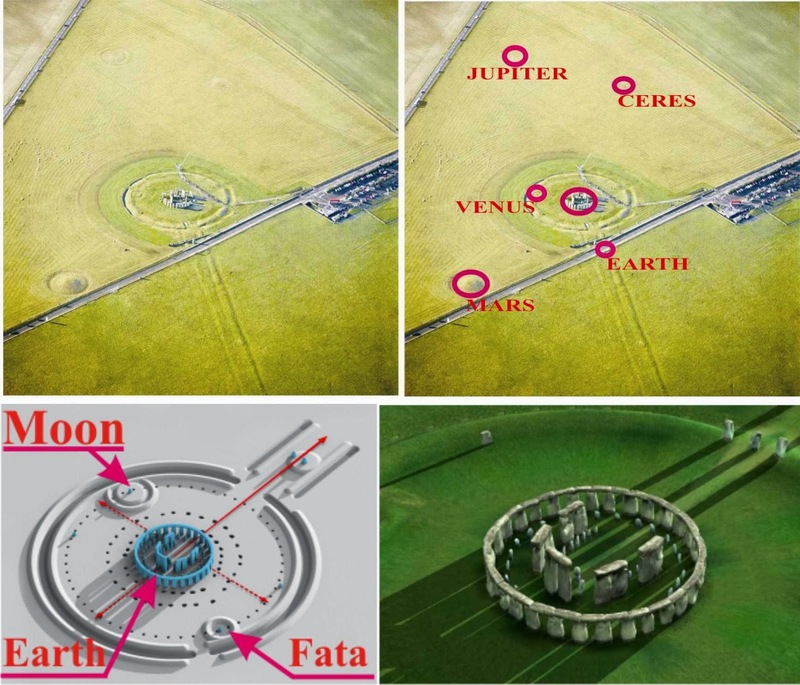 In addition encrypted message of Stonehenge indicates Ceres, former moon of the exploded 5th solar planet and the site needs future expensive astronomical investigations. 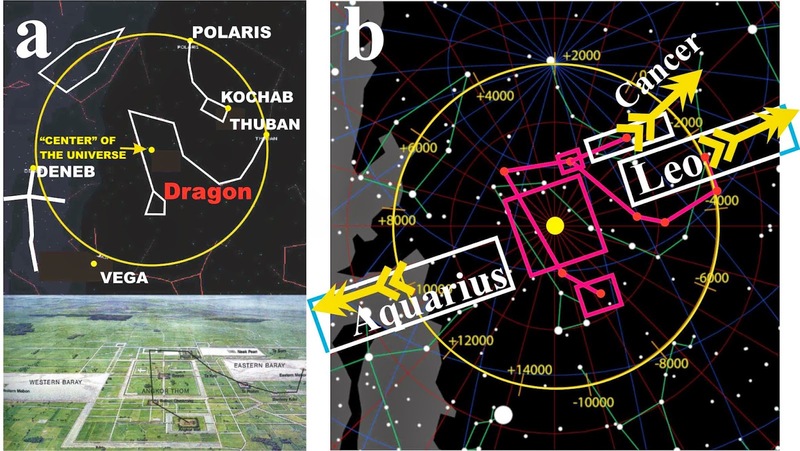 Aryans had old tradition to write epochs by using coordinates of our planets by corresponding constellations. Much more best example we have on the Zodiac of Osiris that shows epoch of Osiris within the Scorpio ~16,500B.C. We have many other evidences in the Egyptian (Aryan) zodiacs. Unfortunately we have no access in huge bins of Vatican or Smithsonian institution to find epochal Aryan calendar, to explain exactly dating by Peak of OrioN (PON). Why is the real meaning of PON in the Teotihuacán same? My knowledge allowed me to calculate real value. This is a real value for the Aquarius Apocalypse in the Teotihuacán PON=45O due to opposite position on the ecliptic from Leo. Encrypted Aryan massage from Angkor Wat between the Apocalyptic events of Aquarius and Leo shows a=178.1O by using precession. ~1% shifting from the half precession cycle between Aquarius and Leo had compensation equivalent due to shifting of orbiting stars around Milky Way and the Earth axis swing (a=21O55'÷24O20'). During the pre-flood epoch, mirror image of Al-Nitak in the Teotihuacán was built on pre-flood N30O. After the Apocalyptic global drifting mirror image of Al-Nitak in the Teotihuacán replaced on modern N19O41'. Mirror image of Al-Nitak on the Giza Plateau, near the post-flood boundary built on modern N30O as well. Now proportional value between the three stars of the Orion’s belt not identical to proportional values between their mirror images on the Giza plateau and Totihuacan. Reason is very simply – shifting of Alnitak Alnilam and Mintaka for thousands of years. Aryan scientists measured epochal value of PON once in year in the midnight, during the orbiting of Earth between Sun and Orion constellation. Thus our knowledge allows us to announce that the Stonehenge is a symbolical memorial (graveyard) and sacred to huge victims of huge tragedy in 10465B.C. Of course Main megalithic circle letter “O” has dual astronomical and dual Alphabet meanings. Dual astronomical value indicates on Earth as well as main heat source - Sun. In the magnificent genial memorial is written encrypted exact data of the last Apocalypse - 21 October 10465B.C. Memorial includes approximately coordinates of the visible solar planets. The summer solstice direction indicates toward the Virgo that was ruling Earth by this time. Unfortunately British engineers built rode over the coordinate of Earth. Jupiter in opposite side moved over the Pisces. Our calculation shows that the Jupiter could move in the Pisces on October 21, 10466±1 B.C, but everything needs exact and expensive astronomical investigations in future. Orbiting Jupiter around Sun after the last Apocalypse, made 1052 full circle. Jupiter has sidereal orbiting period 4332,589Day. I want to note that the genial Aryan author of the magnificent memorial was not a professional astronomer. Orbits of visible planets have no exact proportions. Each Visible planet indicates approximately distance from the Sun and oriented to the corresponding constellation fixed on October 21, in 10465B.C. Last apocalypse began exactly from this date, written in Stonehenge and Giza plateau by using stellar coordinates. There are very many circles within Stonehenge and we have greatest problem to choose tracks of ancient bombardments to human’s joke, to find other real planetary coordinates. We can observe many circles around the “Sun”. Inside the outer megalithic circle we can see Venus and its orbit. Mercury is erased but its approximately orbit is available. Our ground-breaking dating for the mainstreamers is interrelated to post-flood boundary. Thus deadline for the Genial Aryan Memorial - Stonehenge is that - ~10450B.C. I want to ask to British government and clerical hierarchy to introduce annual mourning ceremonies on October 21 at Stonehenge. Of course the memorial needs to be recovered to the primordial form. Before mainstream science is sleeping in the ostrich position and do not want to understand anything on ground-breaking discoveries, politicians and religious leaders have to restore ancient forgotten tradition of our great Aryan ancestors. Rediscovery of Aryan PON for the modern civilization cycle is a phenomenal and magnificent discovery. I want to dedicate this discovery to American genius and the best scientist in the world – Prof. Oliver K. Manuel. We are working for mankind to explain truth. Our favorite information about Forbidden True History and Magnificent Discoveries on Atlantis you can find in the links for free. "The Forgotten Nuclear War Near The Post Flood boundary ~10400-10350b.c." 3. Third book of the unique and sensational trilogy: - PREVIEW - HOW THE PRECIOUS METALS AND STONES EXTERMINATED ARYANS NEAR THE POST-FLOOD BOUNDARY.